Deena Kakaya's Indian-spiced rice pudding recipe uses creamy whole milk and coconut for a satisfying, rich winter dessert. 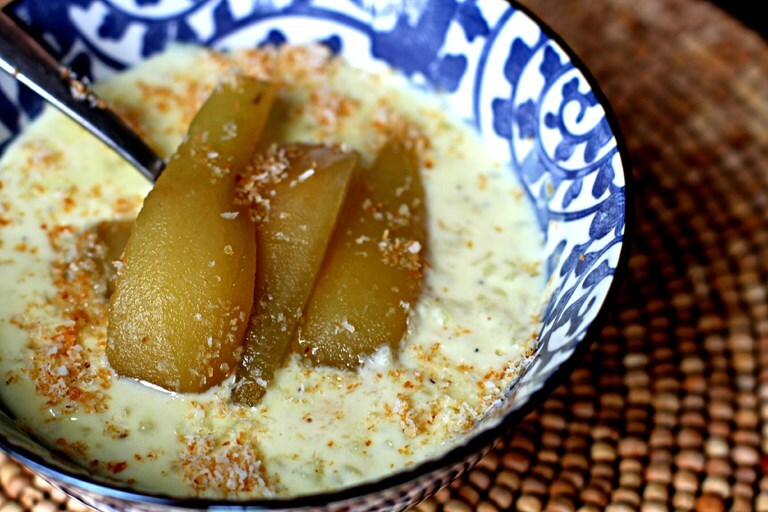 She infuses the rice pudding with cardamom and rose water for an aromatic finish, and completes the dish with perfectly tender poached pears. I recently asked a question on the blog about your favourite milk recipe and quite a few people mentioned rice pudding and some even with the old favourite of a dollop of strawberry jam. I remember doing that as a child. There’s something about the creamy and smooth nature of rice pudding that sits so well with juicy and plump fruit. For me, rice pudding conjures memories of celebrations; rice pudding with all its saffron, cardamom and rose water glory was affectionately made on special occasions such as a family get together, a religious holiday or as a treat for decent exam results. Rice pudding is consequently a happy dish for me and one that feels so bolstering to eat, hot and steaming against the cool air of the winter. My nostalgic temptation has evolved the fruity dollop into some fine and glowing pears with an Indian accent. I poached the pears tenderly, in whole spices including saffron, which has given them a lovely colour. The star anise and cinnamon come through the robust of flavours, but you can most definitely sense the cardamom and cloves.